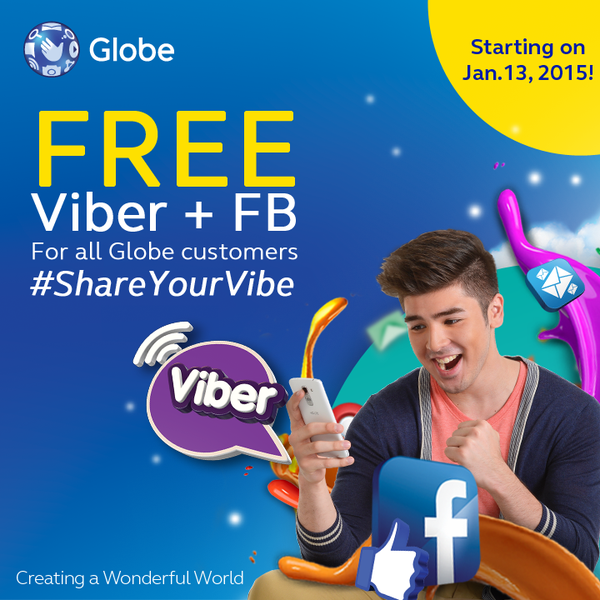 globe subscribers: free facebook + viber! 2014 was a great year for Globe. With foreign telco's increasingly adapting their unique approach, there is definitely much to celebrate! FREE VIBER AND FACEBOOK starting January 13, 2015 FOR AN ENTIRE MONTH! Even better? Absolutely no purchase required, no promo required, no daily registration required, and it's available to all Globe customers (mobile and Tattoo)... plus, it comes with Globe's love and affection so you too can easily reach out to your loved ones this coming Valentine's Day!